Project obstacles and solutions: Metropolitan Development and Housing Agency (MDHA) broke ground on a new 12-level, 1,010-space 5th Avenue of the Arts Parking Garage in 2014. 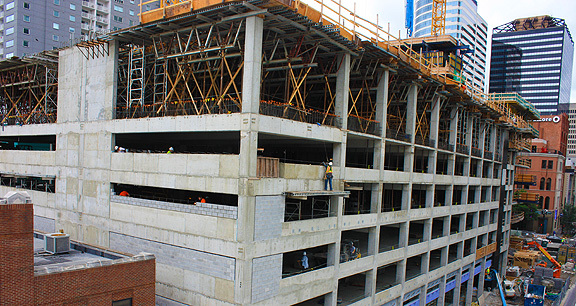 Nashville has experienced incredible growth which has caused a growing need for parking. The new parking garage not only relieves parking stresses in the area, but also provides 8,000 square feet of retail space on the main floor. RC Mathews was the general contractor on this project. Timing and mix design were crucial to this job. Due to the congestion of traffic in this area, all of the concrete work was done at night. The city would shut down 5th Avenue at 7 p.m. to accommodate a concrete pump. The street had to be clear again by 7 a.m. the next morning for traffic. These pours happened up to three times weekly for a year. IMI worked with RC Mathews to space trucks at the correct intervals to keep the concrete flowing during these 12 hour shifts. Every 4-5 minutes, a new mixer truck pulled up to the site throughout each of the floor pours. The concrete for the post-tensioned floors of the garage were also a crucial part of this project. RC Mathews needed a mix that would gain early strength so post-tensioned tendons could be stretched within 3 days of the pour. IMI QC/QA worked with the site engineers to provide a concrete mix that many times met 5,000 psi in 48 hours - 24 hours sooner than the specifications called for. This enhanced the pace of construction on this project. IMI provided 15,000 yards of concrete for this project. For more information on delivery times or gaining early strength in concrete, contact the sales representative for the concrete plant nearest you. Click here.